At MBPC, we believe all Montanans deserve strong, healthy, and safe communities. During the legislative session, we will continue advocating for a strong state budget with responsible revenue that prioritizes investments to create opportunity for everyone, and we will work hard to ensure that nearly 100,000 Montanans do not lose their health care coverage when they need it most. However, our work does not stop there. Our entire team will be dedicated to a range of issues to protect Montana families. Below is an overview of the issues we will be working on for the next four months. MBPC will once again be closely tracking the development of the state budget, House Bill 2. Most state agencies are starting the 2019 budget process below where their budget was two years ago. While state agency budget reductions vary widely, most agencies faced a 5 to 10 percent reduction from 2017 to 2019. The Department of Public Health and Human Services (DPHHS) starts this budget cycle slightly above its previous base from 2017, but many individual divisions within DPHHS faced deep cuts in 2017 and therefore start with a 2019 base well below the previous biennium. Overall, important programs and services that help are still below where they were at the start of 2017. As the legislative joint subcommittees begin to make recommendations on the different sections of the state budget, we will work with partners and policymakers to find ways to restore lost investments and put Montana back on track. 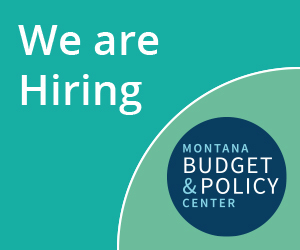 To get a sense of how MBPC is looking at the initial 2021 executive biennium budget, read our report 2021 Budget: An Opportunity to Get Montana Back on Track and Rebuild Public Investments. Protecting the health care of nearly one in ten Montanans is a top priority for us. We are working with partners, advocates, and heath care providers to prevent the sunset of Montana’s successful Medicaid expansion, which has provided health coverage to nearly 95,000 Montanans. We are working tirelessly to prevent harmful changes like restrictive work and reporting requirements that will take health care away from Montanans when they need it most. Montana’s Medicaid expansion has been critical for individuals, businesses, and our overall economy. Check out all of our research, which includes reports, county-by-county fact sheets, and regional data, on Medicaid expansion here. Implementing a minimum tax at the pass-through entity level to ensure that pass-through entities (that have multiple tiers of ownership, many of which are from out-of-state) are paying their fair share of taxes. Stay tuned to our Facebook page as we unveil a series of videos explaining our proposals and how the budget cuts hurt families in Montana. MBPC has been dedicated to studying how housing instability impacts individuals and families living on low-incomes and developing policy solutions that support inclusive and economically viable communities. During the session, we will be working on with the Montana Housing Coalition on Senate Bill 18. This will create a state Workforce Housing Tax Credit program designed to be coupled with federal Low Income Housing Tax Credits, and would provide critical gap-financing needed to increase the supply of affordable rental housing. Across Indian Country, protecting Medicaid expansion is a top priority. The program has transformed access to health care for many American Indians. Because of expansion, nearly 16,000 eligible American Indians have gained access to a comprehensive range of health care services across the state. Not only does this have the potential to address persistent health disparities burdening American Indians, it brings much-needed health care dollars into the Indian Health Service and tribal facilities, which can bill Medicaid for services at their facilities. MBPC will continue to work closely with partners from across Indian Country to ensure Medicaid expansion is extended. Other legislative priorities include greater investments in tribal language preservation and language immersion programs, reentry programs for those who have dealt with the criminal justice system, and economic development in Indian Country. Not all of our work will be proactive. MBPC will dedicate energy to important defense work: protecting SNAP, Medicaid, TANF, and other critical programs from harmful asset tests, drug testing, confusing reporting requirements, and other provisions that keep people from getting the help they need to make ends meet. MBPC will again support legislation to start a paid family and medical leave insurance pool in Montana. The Montana Family And Medical Leave Insurance Act (the FAMLI Act) would pool small contributions from employees and employers to create a dedicated funding stream for workers when they need time off to care for themselves or a loved one. From these small contributions, representing less than half of one percent of wages, eligible workers would receive a portion of their wages while on leave. To be sure, we have much to get done this year to help improve the lives of families in Montana. With our incredible staff, partner organizations, and supporters around the state, we are optimistic of what we can accomplish together.